“There! You just have to be the most beautiful girl my old eyes have ever seen.” Sandro gathered his breath and tore his gaze from Windy's freshly painted face. Then, he carried her to the toyshop's display window and placed her in the very front for all passers-by to admire —and so the exquisitely carved ram's head might behold a world her brand new eyes had never seen. Sandro's toyshop looked out on the town's harbor, giving Windy a grand view of the bustling seaport. Her very first sights took in the curious shoppers and gentry who paraded by the various mercantile shops lining the streets. Along the pier, innkeepers, tradesmen, and fish vendors hustled their wares. Ships of all makes and nations dotted the port, and those dockside crawled with boisterous jack-tars and sailors eager to spend their wages. Windy's best view was of the shipyard across from Sandro's shop. Rising above the frameworks was the hull of a caravel, a merchant ship destined to roam the seven seas in search of wealth from distant lands. How thrilling it must be, she thought, to go voyaging to places past this window sill. Windy's eyes bulged as waves of images flooded her senses. Each passing day revealed new wonders to the shelf-bound Windy and only enhanced her wanderlust. 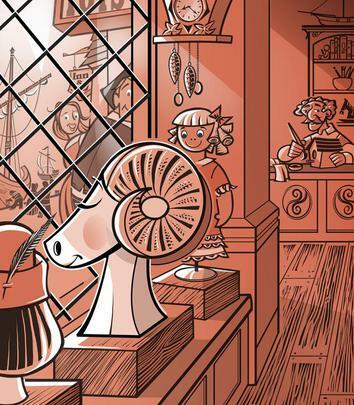 Whenever a customer entered the shop Windy would inhale the crisp salt air perking her ears at the raucous street sounds and horse carts clap-clap-clapping on cobblestone. Although customers would often take notice of Windy, they usually chose another toy, or left empty handed. Day’s end would find Windy still locked behind the storefront window, unsold.